Just a few days ago, I wrote about Kendryte KD233 board featuring Kendryte K210 dual core RISC-V processor, with some fairly detailed documentation, public links to toolchains and other tools. and going for $50. 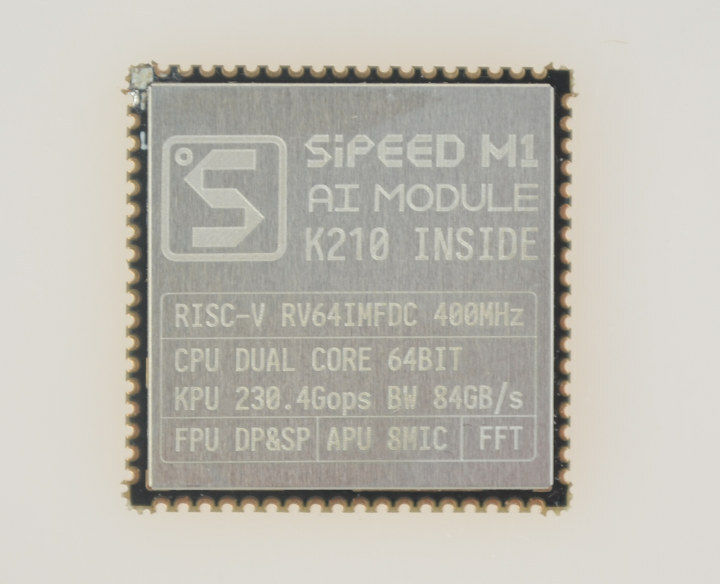 But the team behind LicheePi boards informed me that they also made their own K210 module called Sipeed M1 and selling on Taobao for the Chinese market, as well as on Yoycart for $10.89 plus shipping for the oversea market, and you’ll find a devkit with a dock board for about $24 and up depending on options. But you’ll probably want to get start with M1 “Dan” Dock (Lichee Dan) instead since it offers convenient 2.54″ through holes and a USB type-C port for power and debugging. There are kits with display, WiFi, camera, and so on. With regards to documentation you’ll find resources I already shared in my previous post about Kendryte K210, as well as a Wiki and documentation on Baidu specific to Lichee Dan. The Baidu link however is mostly interesting for the schematics. Whyengineer also posted some code examples on Github. 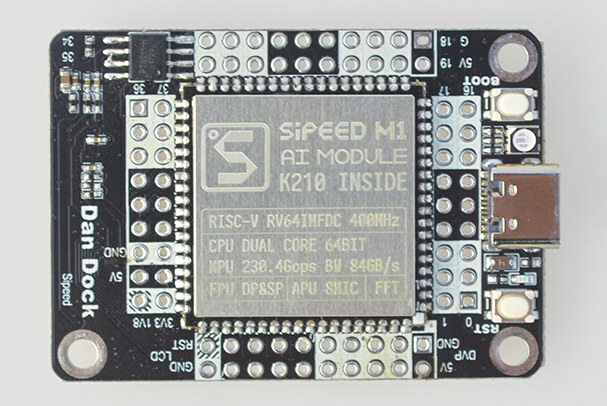 The company said they ported Micropython to the module including XYZ-modem support. Lots of the resources and in Chinese, but they have a Telegram link where you can chat in English if you have questions. A short Face Detection demo has been uploaded to YouTube to showcase the machine vision capabilities of the platform. Here we have an example of a dual core-core RV64 _sans_ the Atomic ISA extension. It was bound to happen. Yes, K210 is a RV64GC, as we discussed it recently under the KD233 article. But does M1 implement the complete K210? The simple answer would be ‘Yes, the laser-etched ISA on the lid is just a typo, and the core is a true RV64GC’. So is it? Ok, so perhaps the vendor needs to update their lid etching to avoid future confusion. An ISA is not just an arbitrary logo, particularly in the context of risc-v.
How nice of them to laser-etch its benchmark figures on the metal shield. I’m going to sit back and watch. Right now, there’s a big move in the RISC-V space on many fronts. PULP, SiFive, SpinalHDL, several others. It’s getting interesting and while it’s nifty, what this is happens to be peanuts in the space, awesome as it is. I’m more interested in seeing if we can get some RV32GC cores made up that boot Linux, for example. Things like that and managing to produce something that while it may not outstrip a GPU, could do as one in a pinch if you’ve got enough cores fielded. Now that I’m back putzing with SpinalHDL/VexRiscv stuff, I’m as interested in providing ability there.